We are adamant about creating both incredible printing and amazing client relationships. We know that you want results, and we are here to make you shine. Here is what a few of our customers have said about us lately. Free Lance Graphic Desginer, regarding retractable banner stands we printed, assembled and shipped to the trade show for one of her Corporate Clients. I received the prints yesterday and they are great. Thank you so much for everything! I will most definitely keep you in mind for any of my future trainings. They are based in New York and called on us for their trade show signage and collateral that we produced in Toronto where their trade show was being held. Chairman of St. James Golf Classic, for the banners and signage for the Tournament. They look fantastic! Thank you again for all of the work you put into creating a great folder for us." So exciting!! LOVE LOVE LOVE the black folders." Marketing Director, Bishop Montgomery High School. They ordered some black pocket folders for promo items to take to recruiting visits to feeder schools. The cards and envelopes have arrived and they are stunning. Thank you to Dan for his great work. And thanks to you too! PS Raffle Tickets arrived last week and all is good with them too. This could be your year my friend!" The books are fabulous! Neal waited for me to come over to open the box and we poured over every page - and we are DELIGHTED. The covers are wonderful - the yellow perfect, crisp photos, the transparency is fab, the folds and flaps are generous and fitting, the coating is beautiful - no cracks here. Of course we love the hard bound - the endpages are beautiful and the binding is great. So we are happy, happy and looking forward to more!!! Again, thanks for everything. It was a pleasure working with you!" Book Desginer, on a hard cover and soft cover color printed book entitled Santa Barbara, Then and Now. 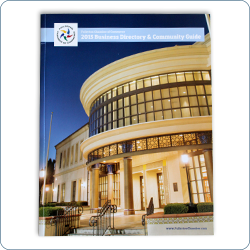 "Lisa and her colleagues at Shanahan Printing + Graphics exceeded my expectations as the printer for our annual Business Directory and Community Guide. The partnership between Shanahan Printing + Graphics, our graphic design firm, and myself was very harmonious. Lisa was personable and efficient in meeting deadlines, staying on task, and asking the right questions throughout the process. While out of town, she also made herself available to keep us posted on the delivery of these 5,000 directories. We are pleased with the results and the entire working relationship. I would highly recommend Lisa to anyone looking to work with a reliable print company and specifically Lisa as print account manager." "Thanks so much for your help with this project!! The printing and mailing were so timely. Just wanted to let you know how much we appreciate your help." 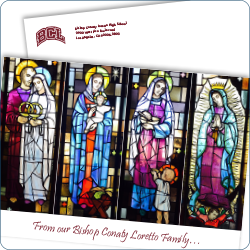 The St. Monica card and mailing is well printed. You’re right — I like the matte finish a lot. And the paper is just right. Thanks for making my client — and me — look good!" Greatly appreciate all of the HIGH level of Customer Service from you and your team on our pocket folders, mugs and pens. I worked in retail for 16 years and understand Customer Service. That being said you have my business!" Director of Social Ventures for the Coalition for Responsible Community Development. You are amazing at your job as you are professional, listen to our needs and stay incredibly focused, and make us very happy. The bags and the labels turned out great and we look forward to working with you again in the future." "Everything looks amazing! I have to say that I was really impressed with your signs. They are so crisp, and the coloring is amazing. So great job! Joe Martin Partner, BDI Events regarding foam core signs printed for a Conference his company produced." 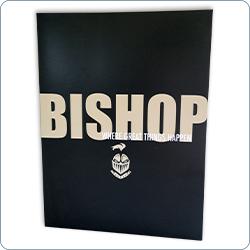 "Thank you for the amazing print job and quick turnaround (the mailers arrived at my house in two days!) of our mailers. They. Look. AMAZING!! You took our design and brought it to life, they are fantastic and a huge hit with our owner, VP, myself and the rest of our staff."